Left Bergen on board MS Norröna, a ferry that connects the Faroe islands with Denmark, Norway, Shetland, and Iceland. Due to problems to get on board all cars, and heavy headwind, the stop in Thorshavn on 26th was only one hour and a half. Therefore passengers bound for Iceland were not allowed to go ashore. 27 June. Seydisfjördur - Egilsstadir, 29 km, 600 m ascent. Slow progress due to waves and headwind during the night. During the day I assembled the bicycle in my cabin (shared with two others that were not there most of the time). Arrived 6 hours behind schedule in Seydisfjördur on the Icelandic east coast. Very nice weather the last few hours. After buying some supplies, I started cycling uphill on the road to Egilsstadir, with a 45 kg load. Reached a cattle grid (rails across the road) and wanted to walk across it. Had some problems to keep the bike upright when I was dismounting it. Too much load. I was offered a lift across the mountains by the driver of a big camper, but declined. Took 2 3/4 hours to reach 600 m elevation. Took it easy downhill not to overstress the frame. It felt a bit flexy. The bike is specified to carry 35 kg. At 21:40 I arrived in Egilsstadir, 3 1/2 hours after the start from Seydisfjördur. I stayed overnigth at the camping ground close to the main road intersection. It cost 500 ISK (about 6 USD). 28 June. Egilsstadir - Hellisheidi, 69 km, 600 m ascent. Tried to find a long belt to secure the big load, but in vain. It would also be used for pulling the bike in the worst uphill sections of the gravel roads. Started at 10:00 and rode continuously 20 km to the Jökulsá á Dal bridge in fine weather, but headwind. Tarmac all that way. Turned north on to road 917 towards Héradsflói, and the tarmac ceased rather soon. More headwind, sometimes gusty. The road had been destroyed by flood near Slédbrjótur, and a detour was under preparation. That meant an extra 7 km on very loose surface. I had to push the bike a couple of kms. Reached the start of the Hellisheidi mountain crossing at 18:15. The wind increased further and fog and rain starded. Progress was slow, 4 - 5 km/h on the lowest gear, and suddenly I was hit by a wind gust so strong that I fell. I didn't hurt myself except for a scratch on the leg, neither was the bike damaged. I had to push and pull the bike all the time when I had passed 250 m elevation. A road sign said the slope was 12%. At some places the wind was so strong, that the front wheel left the ground while I was pushing the bike uphill. At 600 m elevation there was another road sign I first thought said that it would be 14% downhill the next 1.5 km. Since I couldn't see very well due to fog and rain on the glasses, it would be too tricky to go downhill in this weather. I think it must have been storm (24 m/s or more) in the windgusts, because it was difficult to stand even when I had laid down the bike on the road. There was a rescue hut not far from the place. These rescue huts belong to Slýsavarnarfélag Íslands (Icelandic rescue association) and as a rule they are intended for use only in emergency situations. Putting up the tent, yes, it had been possible, but with risk of having it torn to pieces. Walking downhill 14%. Yes, but when I was back at the road sign I saw it said 14% uphill! Probably even worse weather at the 700 - 750 m altitude that would mean. The clock was 21:15, and I decided to stay overnight there and hope for less wind the next morning. I carried all equipment to the hut, cleaned up inside it, had a hot soup and made a bed from a matress and my sleeping bag on the floor. I was very tired and fell asleep almost immediately. 29 June. Hellisheidi - Skeggjastadir, 69 km, 400 m ascent. Woke up at 06:30, not very much wind any more, but foggy and a light drizzle. Started the 14% climb at 8:00, no problems. After the highest point at 663 m elevation there was a sign saying 14% downhill the next 7 km, it was very steep an had to be taken carefully at 6 - 10 km/h on the meandering gravel road. Came under the fog and saw Vopnafjördur town across the bay. Arrived there at about 11:30. Bought some food at the local store and enjoyed a lunch on the concrete platform outside the store where it was shelter from the temporary drizzle. Continued towards Bakkafjördur at 13:00 on tarmac (20 km) and gravel (10 km) road to the road intersection 5 km west of Bakkafjördur. Turned left to Skeggjastadur, where I stopped and looked at the church. 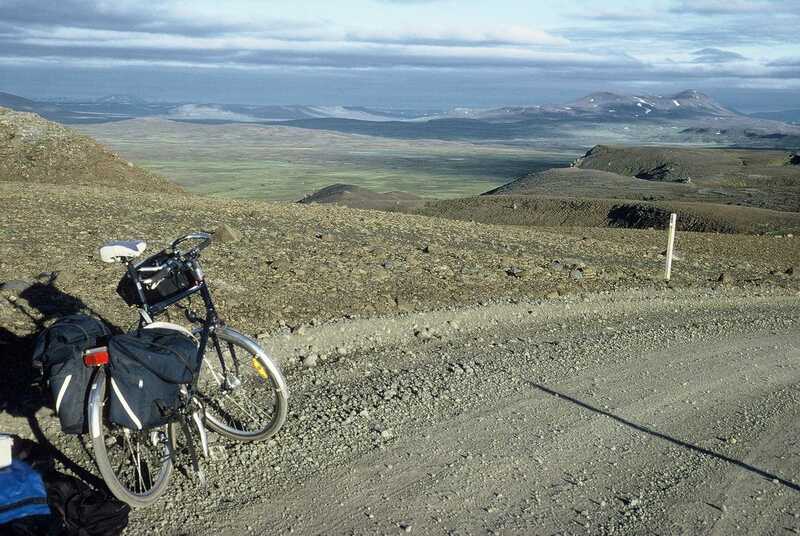 Just north of Skeggjastadur I met Swiss 65 year old cyclist Josef with a 3-geared modified mailman's bicycle. He had had a local Swiss workshop to make a big (about 30-tooth) sprocket to have 1:1 as the lowest gear. But still he had to dismount and pull first the bike, then the trailer in 300 m sections when going over the mountain passes. He had been 19 times on Iceland and this year he was going to be on Iceland all summer. I continued another 5 km to a place suitable for reaching latitude 66 degrees N, longitude 15 degrees W, about 3.6 km south of road 85. Found a good place to put up the tent just beside the road, with a suitable fence post to lock the bike. The weather was becoming better, with fog only to the west and after a supper I started walking towards 66Nx15W. Saw several whooper swans, purple sandpipers and golden plovers. Reached the desired point at 226 m elevation just when the clouds dissolved and the fog retreated westward and took a series of photos for the Degree Confluence Project (see www.confluence.org). Went back to the tent in nice weather, arrived there at 22:45. 30 June. Skeggjastadir - Laeknesstadir (Langanes), 62 km 300 m ascent. Got up at 7:30, beautiful weather. Cleaned the bike, got on the wheels at 11 o'clock. Tailwind 6 - 10 m/s. Stopped for photography and relaxing in the sun on the leeside of a pile of driftwood at Finnafjördur. Continued in crosswind northward, and in strong tailwind westward over Brekknaheidi. Reached 52.5 km/h downhill near Thorshöfn, without feeling any drag from the wind. Had a pizza in Hafnarbar-inn (800 ISK). Continued at 16:00 in headwind and sometimes fog. Many birds along the shore north of Thorshöfn. A black-tailed godwit ( Limosa limosa) flew over me with a falcon-like sound. Reached Laeknesstadir ruins halfway out on the Langanes peninsula and put up the tent close to the little creek Laekjanesstadaá. 1 July. Langanes, 50 km, about 200 m ascent (smaller hills uncounted). 12 degrees C at 8 o'clock. Left most things in the tent and rode out to Fontur, the lighthouse at the eastern tip of Langanes. Rather rocky road for about 4 km, got some new scratches on the bike. Saw 2 adult and 3 young gannets on an instruction flight 25 m below the crest of the 50 m high cliffs at Fontur. Majestic. Fulmars and kittiwakes flew along the crest and passed me at a distance of 3 - 4 meters. Fulmars, kittiwakes and guillemots were nesting just below the crest. Took some photos of the birds lying down at the crest, which was undermined at several places. Rode back towards the solitary rock Stóri-Karl, where the gannets nest. Saw Puffins and razorbills just east of Stóri-Karl. The top of Stóri-Karl is crowded by gannets. A few of them rested on a nearby cliff just 50 m from my camera. Had a half hour with sunshine, the rest of the day was rather cloudy. Saw about 500 male common eiders lift from the sea surface simultaneously. A gorgeous sight. They had probably never seen a cyclist before and got scared. Also about 500 kittiwakes sitting on the cliffs suddenly sailed down just spreading out their wings. They did so without any obvious reason, I had been watching them for a long while and was sitting still. 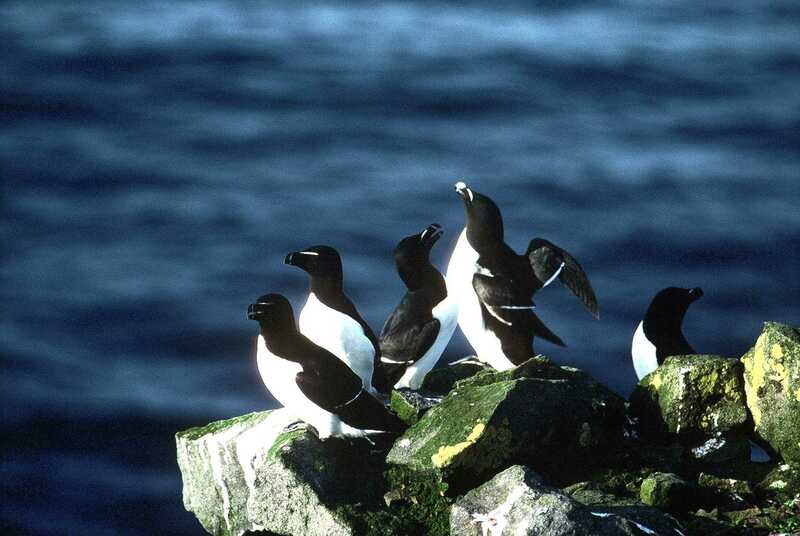 Other birds observed on Langanes include black guillemot, herring gull (Larus argentatus), great blackbacked gull, arctic skua (Stercorarius parasiticus), arctic tern, redshank, dunlin, golden plover, meadow pipit, snow bunting. Got back to the tent at 21:15, 10 degrees, soft breeze from the east. 2 July. Laekjanesstadir - Múli (Axarfjardarheidi), 84 km, 650 m ascent. Light drizzle that ceased at 08:00. Set off at 09:30 towards Thorshöfn. Saw white wagtail, ringed plover and a lot of horses. Had a steady lunch at Hafnarbar-inn for 1200 ISK. Continued to Svalbardsá, where a new bridge and road was under construction. The new road will be about 5 km shorter than the old one. Took the mountain gravel road across Axarfjardarheidi, highest road elevation was 399 m. Very beautiful with the low sun in the north. Got a flat tyre 500 m before the Múli rescue cabin. It was OK to stay in this cabin according to the regulations posted inside. There was also a garage included in the cabin, but no tools, only some kerosene. Water had to be taken from upwelling water in the mossy area north of the cabin, there was no creek or lake. Repaired the tyre and cleaned the transmission. This was ready at about midnight. Temperature outside 5 C, inside the cabin approximately 13 C. Beautiful sun in the north, its center did never go below the ground despite the place being about 45 km south of the arctic circle. The sun was at its lowest position at about 01:05 Icelandic time and I think the whole of the sun's disk was visible. This is the combined effect of two facts. The land is substantially lower to the north. The light is diffracted (bent) when the sun is low. Went to sleep at 01:50. 3 July. Múli - Tjörnestá, 76 km, 300 m ascent. Got up at 06:35. Tyre flat. Found a second small hole al little more than 1 cm from the first. Started cycling, but after 10 m the tyre was flat again. Found a third hole close to the other two. Finally got on the wheels and rode in fine weather on the gravel highland road. After 7 km the tyre went flat again. Found a fourth extremely small hole, so that the four holes formed a square with about 1.5 cm side. The tyre wall got damaged and started to tear apart. The chain lock worked loose and the chain split when I missed a gear in an ascent with very sandy and rocky road. It took a while to clean the chain and repair it. Got to Ásbyrgi ESSO after 4.5 hours (3 hours of cycling, 1.5 hours of repair). Wind from west was increasing. Had a big meal and continued towards west and north towards Tjörnes Peninsula. Tarmac road for 22 km. The sky went overcast and it was substantially colder. Highest elevation 138 m, recorded at 3 places with 30 - 40 m depressions in between. Arrived at the farm Mánárbakki at about 21:00 hours an continued to a gate saying ALLIR ADGANGUR BANNADUR, means All trespassing prohibited, and tented there. Several redshanks in the vicinity and two red-necked phalaropes in a pond 40 m from the gate. Put a layer of Liquisole glue on the ruptured part of the rear tyre. 4 July. Tjörnestá - Hólasandur, 68.5 km, 700 m ascent. Got up at 10:30, foggy weather. 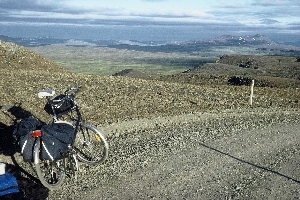 Took down the tent and cycled uphill towards Húsavík about 1 km. There it was a dirt road along the western side of Tjörnestá and I could go almost up to a sheep fence. Walked up to the lighthouse, but no good weather for observing birds, too foggy. Saw a few fulmars, a snipe, many eiders and some puffins. Went back to the bike and met a group of about 10 English people on bikes, accompanied by a big support van. Asked them if they could spare me a tyre. They couldn't but told me there were two bike shops in Húsavík a further 24 km south. I continued, with the rear tyre somewhat unstable, but better than the last few hours the day before. Visited the fossil museum at Hallbjarnarstadir 17 km north of Húsavík. One of the few places on Iceland with marine sediments is on Tjörnes. Continued to Húsavík, several black-tailed godwits and whimbrels observed. Tried to find the bike shops. The first one I found had a hand painted bike sign, but had newly been converted to a car workhop, but the owner told me the cycle shop had moved to the north part of the town and was now established in a house with the sign Prentsmidjan Örk (Printing Office The Paper Sheet). Purchased their smallest 26 inch mountain bike tyre (26x1.95) for 1370 ISK. Could fit it inside the mudguard, but the clearance was only 1- 2 mm, so every time the tread picked up a piece of gravel, there was a terrible noise from the mudguard. Purchased one litre of burning spirit at Olís for 615 ISK, bought some fresh food and sat on a bench at the sea and had an evening meal. Continued at 19:30 to Hveravellir and took a few photos of the hot springs there in the last sun (clouds were coming in). 10 - 12 black-tailed godwits passed. Went on uphill, in fog over 250 m elevation, to Hólasandur, got above the fog just when the altitude of the sandur was reached. Very beautiful rainbow around the shadow of myself when the sun penetrated the fog. Reached the rescue cabin on Hólasandur in extremely fine weather at midnight. Had a long rest while the sun was ascending in the northeast over an arctic desert landscape. 5 July. Hólasandur - Mývatn, excursions in the Mývatn area, 46.5 km. Continued early in the morning and rode the last 15 km to Reykjahlíd and put up the tent at the camping ground. It is prohibited to camp elsewhere in the Mývatn district. Cycled towards Stóragjá cavern 2 km south of the campsite, but got a flat tyre after 1 km, and had to walk back to the tent to get the repair tools. After repairing the tyre I got to the cavern and had a full hour swim in the underground stream in 21-24 C water. Wonderful. After that I continued to Grjótagjá (Rocky) cavern with 50 C water, and sat naked beside the underground stream and poured the hot water over my body, almost like a sauna bath. Then I rode back to the tent, had a meal, then cycled to Hverarönd sulphuric mud pools (solfataras). The ground is unstable there and you cannot walk everywhere. Blue-gray mud is boiling and produces small or big (depending on water content) bubbles that burst. The ground is yellow and reddish and the noise from an abandoned hot water well is penetrating. The smell of sulphuric dioxide is everywhere. Met the English cyclists in the area. On the way back to Reykjahlíd I reached 61 km/h (unladen bike) in the descent from Námaskard pass. Left the camping site at 08:00 and cycled south to Höfdi, an old farmstead that was donated as a nature reserve by the former owner. Horned grebe swum in Mývatn close to the shore at Höfdi. 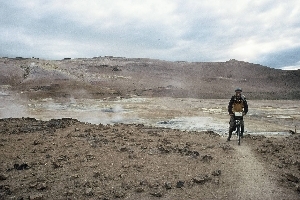 Rode to the other side of the litte bay, where lava formations are very peculiar and colourful. Continued to Laugar, on the main road no 1, which partly was very rough due to lack of maintenance. Sat in 22 C temperature on the leeside of the store and ate some apples that cost 74 ISK each (almost one US dollar). Continued to the horse-shoe formed Godafoss waterfall and then towards Akureyri. Rain showers occurred. There are three roads from Fnjóskadalur to Eyjafjördur, one is meandering over Vadlaheidi and is not maintained, another is along the Fnjóskadalur valley and is rather flat but long, the newest is tarmac but rather steep on the Eyafjördur side. I took the tarmac road. Had to use the brakes quite much, didn't dare to go faster than 50 km/h. The temperature dropped substantially, maybe 7-8 degrees, at about 200 m elevation, and the air became moist. 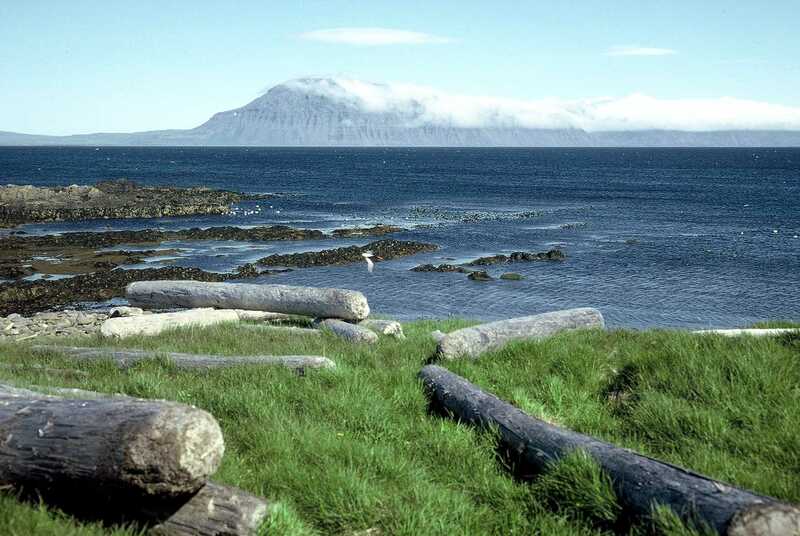 It was the cold north wind from the Arctic Ocean that blew in along Eyjafjördur. The last 3 km to Akureyri it rained heavily. I found an Internet cafe in the town and sent a few messages at a cost of 300 ISK (about 3.5 USD) for 15 minutes. Rode to the residence of my friend Gunnar, but he and his family were not at home. They were at a wedding in Laugar. Got a pizza at a big pizza outlet and cycled up to the camping site, which was crowded due to a youth football league. Quite noisy, but I fell asleep rather soon. 7 July. Akureyri, Öxnadalsheidi - Bólstadarhlíd 69.5 km, 400 m ascent. Met Gunnar and his daughter Heidur and had a long chat with them. Iceland's small ecomomy is very sensitive to various changes and the effects show earlier and clearer than in larger economies. The anti-inflation regime and suppression of the salaries of state and communal employees since 1983 have driven nurses and teachers to other professions. Now the scarcity of these categories of people has driven their salaries up quite a bit. Gunnar drove me 50 km to the Öxnadalur pass at 550 m elevation on the road no 1. Downhill and flat to Varmahlíd, but some headwind. There was a hestamannamót (horsemen meeting) in the vicinity and 10 000 people around, among them the president Ólafur Grímsson and the English princess Anne. Traffic congestion. Continued after a dinner to Bólstadarhlíd. A lot of fog above 200 m elevation, but 2 - 8 m/s tailwind. +8 C at 20:15 in Bólstadarhlíd. Price for a sleeping place (svefnpokapláss, on a mattress) 1000 ISK and breakfast 600 ISK. Shower included. 8 July. Bólstadarhlíd - Bordeyri, 123 km, 400 m ascent. Some sun in the morning. Rode pat Svínavatn and reached road no 1 11 km south of Blönduós. Very strong headwind to Stadarskáli, where I could get 10 000 ISK from the hradbankí (ATM). Continued to Vídiskáli for a meal. 10 - 15 m/s tailwind along Hrútafjördur to Brú, where I turned 180 degrees to the north leading road no 61. Headwind of course. Had to fight furiously to reach Bordeyri 12 km further north. Stayed at the small but very expensive campsite (700 ISK) and put up the tent close to the windbreaker. 9 July. Bordeyri - Snartartunga, 48 km, 300 m ascent. Strong wind from north, but some sun. Rested in Bordeyri until 15:00. +15 C, 15 m/s wind when I rode north, average speed 8 km/h, but reached 64 km/h in a downhill slope in Bitrufjördur. 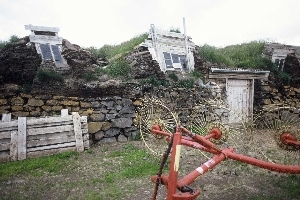 Stopped at a farm, Snartartunga, in Bitrufjördur. Stayed overnight there for 1393 ISK, I hadn't change to pay 1400. Nice family and good svefpokapláss in a bedroom. Shower. Their map of Sweden delighted me. My little home town Boliden (1700 inhabitants) was marked, but not the nearby city Skellefteå (40000). Saw red-throated diver in Bitrufjördur. 10 July. Snartartunga - Steingrímsfjardarheidi, 92 km, 800 m ascent. Left Snartartunga at 8:30. Much headwind until Hólmavík, 6 km of road works with very loose gravel along the north shore of Kollafjördur. Had to push the bike several km. I read in the newspaper a few days later that a truck turned over at this place. Arrived in Hólmavík at 16:10 and bought food for the next 5 - 6 days, because there are no shops until Súdavík near Ísafjördur. Had a big meal at the good-looking camping site (overnight price only 300 ISK, shower 200 ISK extra). Continued at about 18:00 in sunny weather and most of the time tailwind, very gusty. Reached the cloud level at about 420 m elevation and arrived at the Steingrímsfjardarheidi saeluhús (elevation 440 m) at about 21:00. Strong wind from the north, and moist fog. Tried to fix the front gear in the saeluhús. Gear changes had become almost impossible. Worked with the mech until about midnight. 11 July. Steimgrímsfjardarheidi - Laugaland, 44 km, 100 m ascent. When the mech worked again (not satisfactorily though), I started the descent to Ísafjördur fjord (not the town). Foggy, but less wind, easy to go downhill. Took gravel road no 635 towards Melgraseyri and then the short road no 638 to Laugaland. Passed the farm, nobody outdoors. Continued to a grassy patch near a small stream about 1 km from the farm and put up the tent there. A rain shower passed. Had a meal, fell asleep and woke up at about 13:30. Started a footwalk at 14:00, aiming at latitude 66 degrees north, longitude 22 degrees west, at 480 m elevation on Ófeigsfjardarheidi and close to the old horse riding trail between Laugaland and Ófeigsfjördur. I walked 4 km into Skjaldfannardalur and across Laugalandsfjall (350 m) over to Hraundalur and up to Ófeigsfjadarheidi. It was mostly rather easy to walk on grass, moss or rocks, but steep uphill and downhill at a few places. The weather became better all the time, but when I passed the highest point on Ófeigsfjardarheidi and could see the goal at 500 m distance, a wind started to blow from the east. It moved the fog curtain in the east over my destination, and when I reached it at 21:10, it was foggy there. I waited one hour and started to walk home, but when I reached the highest point again, the wind started to blow from the west an the sun appeared again. I rushed back to the destination point, but it was still foggy there. I could see the blue sky overhead, but only a few meters to the side. After another hour, the fog had sunken so that the mountains around me became visible. I could see the horse trail cairns on a row. The nearest one was only 100 m to the north. Very beautiful, but the sun was now below the ridge in the north. I took some photos for the degree confluence project and walked home, happy. I chose to walk along the horse trail in Hraundalur. It was a rough path, rocky and overgrown with grass. The sheep had made big holes at some places. I got an inflammation in the leg and had to walk slowly. I even took a nap on a small grassy hummock. I reached the tent at 06:35 after a 40 km walk. 7 hours up and 7 hours 35 minutes down. Saw and heard a lot of birds under way: Arctic skua, arctic tern, harlequin duck, 7 whooper swans, black-tailed godwit, maybe 100 whimbrels and golden plovers, about 50 redshanks, many dunlins, a few purple sandpipers, two adult and one young ptarmigans, meadow pipit, many redwings, raven, snow bunting. 12 July. Laugaland - Mjóifjördur, 60 km, 400 m ascent. Got up at noon. When I passed Laugaland farm, I was invited by the farmer, Thórdur, for a cup of coffee. I got many. The farm's name is from a laug, a warm spring at a small distance from the house. Thórdur told me that the black-tailed godwit was first observed in the area some 10 years ago, and it was increasing all over Iceland. When the road across Steingrímsfjardarheidi was built and the local ferry M/S Fagranes discontinued its weekly tour to Ísafjördur town, the local economy changed a lot. People in his area now got 70 km to the shop in Hólmavík instead of 200 km to Ísafjördur. The settlements along the south coast of Ísafjardardjup were abandoned, while the easternmost settlements got an upswing. There had been an unusual drougt in northwest Iceland this year, the grass was not growing much. While we were talking, there was a radio message that an earthquake had occurred in the Vatnajökull area (southeast Iceland). I continued at 16:30. When I reached road no 61 again and the shore of the fjord Ísafjördur, there were a lot of birds fishing: Glaucous gull (many of them), common gull, lesser black-backed gull, great black-backed gull, herring gull, arctic tern, puffin, also a common seal (Phoca vitulina). Got very warm uphill Hestskard, and very cold downhill. Put up the tent on a nice place at the head of Mjóifjördur. A light drizzle for a short while, most of the day was dry. 13 July. Mjóifjördur - Litlibaer, 68 km, 200 m ascent. Started at 10:30, reached Djúpmannabúd restaurant after 4 km (they also had a small campground). Bought some Icelandic Skýr med rjómablandi (a kind of youghurt with cream and milk) and Seytt rúgbraud (boiled rye bread, very dark, boiled in this case is meaning heated at 100 - 120 degrees celsius for 12-20 hours, the original method involved a hot spring). A light drizzle followed me north to Ögur, easy riding in tailwind. Not so funny going in the opposite direction into and along Skötufjördur. On the west side of Skötufjördur an intense rain took me by surprise from behind and I stopped at Litlibaer, an abandoned farm now being repaired by the energy authority (Landsvirkjun). The wind and rain increased and after having a meal I decided to stay overnight inside the old stable, where a lot of building material was stored. I slept on a pile of recycled boards, not so comfortable but dry. 14 July, Litlibaer - Ísafjördur, 84 km, 100 m ascent. Left Litlibaer at 8:40 as soon as the rain ceased. Soft breeze from south, 12 degrees C. Arrived at latitude 66 degrees north, longitude 22.99 degrees west at about noon. The confluence point was on the Álftafjördur fjord about 270 m from the shore. 2 whooper swans (álft in Icelandic) flew along the shore. I continued to Súdavík, met a touring cyclist heading towards Hólmavík. Had some junk food at the gas station in Súdavík, didn't get any energy from it. Continued in almost calm weather to Ísafjördur airport where I booked a flight to Egilsstadir over Reykjavík the next morning. Cost 12000 ISK. Stayed over night at the youth hostel in the college building (1100 ISK including shower). Made a thorough clean-up of the bike in the evening. 15 July. Air transport Ísafjördur - Reykjavík - Egilsstadir, 8 km cycling on flat roads. Got up at 5:10 and cycled the 5 km to the airport. Spent an hour to pack the bike for transport. Disposed of all burning spirit and matches, those were not allowed to bring on to the aircraft. A Fokker F50 took me to Reykjavík. Went from the city airport to an Internet café in town and sent a message. 250 ISK for 33 minutes. Rain on the way back. Had to pay some 2000 ISK extra for the bike. Left Reykjavík at 13:00 in a small Fairchild Metro. Cloudy all the way to Egilsstadir. Used 2 hours to put the bike together and cycled the 3 km to the camping site. The price had now increased to 550 ISK. Booked me in for 2 nights. Went to sleep already at 18:30. Very much traffic and noise, was awakened by some intense door slamming and shouting at about 20:00. Got out of the tent and put my finger over my lips and said schh to some people nearby and went to the toilet. When I came back 10 minutes later, the warden was there and accused me for yelling at people, which I had not. Had a long and embarrassing discussion with her, she stating that others may yell as much as they want at each other until 23:30 while I must not yell at others. I had not yelled nor said anything to anybody except the schh until she came, and I asked her if I could get my money back if I moved to another campsite the next morning. That was OK she said. Didn't sleep well, it was a lot of children playing until long after midnight and people driving and idle running their big diesels and discussing loudly all the time until I fell asleep again around midnight. I understand that the children need a lot of activity after a full day in a car, but what cyclists need is a good nights sleep every night. 16 July. Egilsstadir - Múli - Atlavík, 66 km, 200 m ascent. Got my 550 ISK back and an apology for the embarrassment. Cycled to Atlavík campsite in Hallormsstadaskógur. Chose a place for the tent as far as possible from all activities. Cycled to Múli farm where the people were harvesting hay. Asked for permission to leave the bike at their house and walked 885 m up Múli to 65N x 15W. After documenting the place, I returned to Múli farm and took some pictures of the work going on. Very friendly people. Cycled on the west side of Lagarfljót to see Valthjófsstadur church and Icelandic author Gunnar Gunnarsson's living house (unusual arcitecture). Saw the sign to Hengifoss waterfall (Iceland's hihgest vertical fall) at a parking place where the new road to Snaefell mountain (1833 m summit) starts. Other signs told about the plans to build a large dam and hydropower plant and lead water from Jökulsá á Brú to Lagarfljót, and to build a large aluminum smelter at Reydarfjördur. Met a touring cyclist at the place. He had ridden 900 km and was heading for the Snaefell hut. I cycled back to Atlavík, where an orchestra had come and produced more noise than music. I asked the warden when they were supposed to leave and she assured they would go by 21:00. They stopped at 21:30 and I paid my fee. The caravan part of the campsite was absolutely full. Maybe 100 caravans and trailer campers were there. 17 July. Egilsstadir - Seydisfjördur, 63.5 km, 700 m ascent. Some rain during the night, therefore rather silent. Sun during the morning. I rode to Egilsstadir, then across Fjardarheidi to Seydisfjördur. 11 degrees C and 5 m/s wind according to the weather hazard sign. Reached 72 km/h on the downhill side. Found an Internet café in Skaftafell-Menningar house (near an ESSO gas station). Cycled to Vestdalur and put up the tent with a magnificent view over the fjord and the town. 18 July. Seydisfjördur, 3.5 km. Left Iceland by Norröna ferry at noon after 1402 km of cycle touring. Arrived in Thorshavn, Faroe Islands at 06:00 the next morning and had three days in very good weather there. Not widely changed across the world, and if you can get it, a very odd exchange rate. Automatic teller machines (ATM:s) are abundant, the first one I found was in a big supermarket north of the camping ground and gas station in Egilsstadir. I could get a few thousand ISK at the ferry at a horrible exchange rate. 1000 Icelandic krónas (ISK) equals about 110 Swedish kronas (SEK), 12 USD, 12 EUR, or 7.5 GBP. Ferdakort Ísland 1:500 000 (1150 ISK) is a good map showing the road surface conditions fairly accurately. Doesn't ahve any contour lines, so the elevation at mountain passes cannot be estimated. Can be found at any gas station and in supermarkets. Adalkort Ísland 1:250 000 is a 9 map series. Fords are marked on mountain roads. Contour lines every 20 m. My trip covered map sheets 1, 4, 5, 7 and 8. Reykjavík is on map sheet 3 and Seydisjördur on map sheet 8. Price about 700 ISK per map sheet. Is sold at book stores and at some supermarkets. It is rather bulky to bring all 9 maps. There are local 1:50 000 maps covering some touristic areas, Mývatn and others. About half of road no 1 on north Iceland is hard surface road, mostly a coarse tarmac. On southwest Iceland all of road no 1 has hard surface. Gravel roads in the highland can have rather coarse and loose surface, especially in curves. A sign saying TORFAERUBÍL means that a specially equipped 4WD car is needed to drive on the road. Usually a difficult ford is ahead. In heavy rain those fords may be dangerous also for cyclists and walkers. The water in the rivers coming from the glaciers is opaque (you can't see through it at all), so you can not see how deep it is or if there are rocks and holes. Early in the summer many mountain roads are closed due to snow. In early May even larger roads are closed, for example road 60 north of Króksfjadrarnes on west Iceland. At that location, the blocked part of the road is maybe 500 m long and a bike can be carried across the snow field. Snow depth at the place can be well over 5 m, but in spring it is hard packed. There are a few tunnels in Iceland. The one under Hvalfjördur (south of Borgarnes) is not allowed for cyclists. Another tunnel is west of Ísafjördur. Good light is mandatory there, according to hearsay. Drivers on east Iceland were careful. Not so good though closer to Reykjavík. It is usually OK to put up a tent in areas well out of sight from inhabited houses or cottages, but if possible, ask the landowner first. 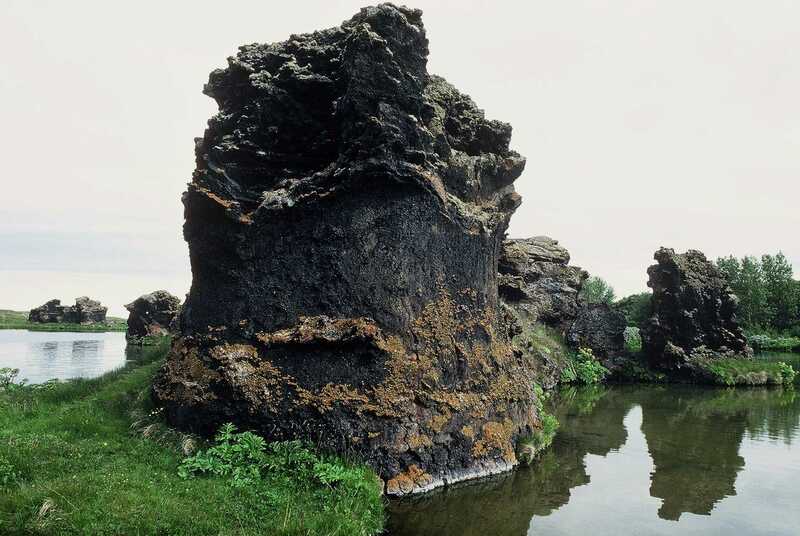 In Mývatn district camping is allowed only at the camping ground in Reykjahlíd and at a couple of hotels. Camping is prohibited from Seydisfjördur to the mountain pass on Fjardarheidi (water protection area). If you find an orange cabin with the Slýsavarnarfélagid sign, entrance is allowed only in case of emergency. The only exception is the Múli cabin on Axarfjardarheidi, which can be used with care. Many rescue cabins are littered by ignorant tourists. They are put up by a voluntary organisation with the purpose to save lives when in danger. Campsites at touristic places usually are very crowded in July. Especially Laugardalur (in Reykjavík), Thingvellir, Húsafell (near Reykholt east of Borgarnes), Akureyri, Reykjahlid (Mývatn), Atlavík (Fljótsdalur, near Egilstadir), Skaftafell (south of Vatnajökull), Thorsmörk (north of Eyjafjallajökull), and Landmannalaugar (north of Mýrdalsjökull) are popular among Icelanders. There is a camping site close to Keflavík airport, good to know for those arriving by air. Camping gas and ethanol (burning spirit, brennsluspíritus) can be bought at gas stations, but the ethanol is expensive (600 - 700 IKR for 1 litre). In remote areas the gas stations may not have ethanol. Try at the drug store. You can bring burning spirit to Iceland aboard the ferry, according to the rules 2002, but it may be prohibited later. It is always prohibited to bring any flammable material aboard an aircraft. Fishing gear must be sterilised when entering Iceland. Hotels in Reykjavík and Akureyri are regarded expensive. Edda summer hotels are open at boarding school locations at several countryside places. There are several tourist huts (Ferdafélag Íslands, Iceland Tourist Association) in the mountains, also along mountain roads. 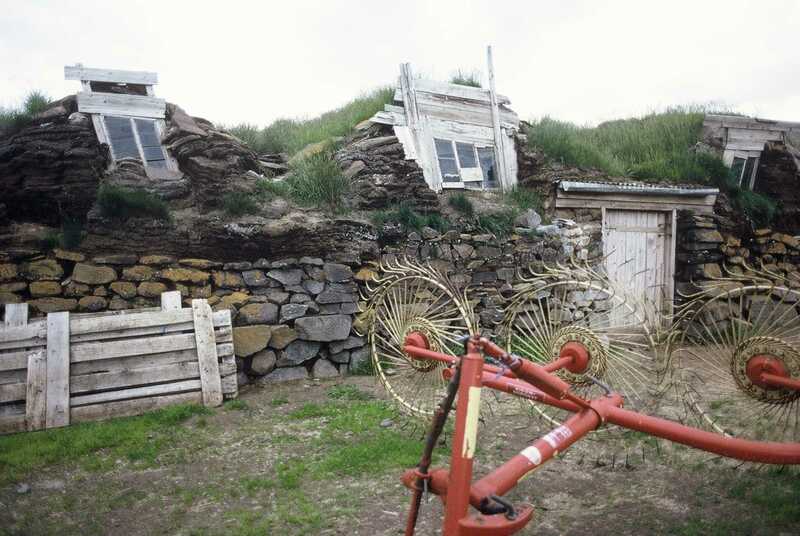 Several farms offer Bed and Breakfast or svefnpokapláss (place for your sleeping bag) in the Ferdathjónusta Baenda (Farmers' service for travellers). There are a few Youth Hostels around Iceland. Food is rather expensive, except some dairy products. Restaurants are usually expensive, but highway restaurants along road no 1 do not crash your budget. Hiking food (lightweight stuff) may be very difficult to get. Food on the Norröna ferry was expensive. Most clear water streams have excellent water. Glacial rivers look nasty, but the water is good. Don't use water that pass inhabited farms or horse grazing fields. My bike is a Thorn Nomad, customised to carry 90 kg of myself and 35 kg of luggage. I started with 45 kg of luggage. Came home with about 32 kg (and myself down at 80 kg). The Nomad made it well except for a slight instability at low speed and steep uphill going when it was loaded with 45 kg (all packed behind the saddle with a rather high center of gravity as a result). Gearing was 44-32-22 front and 11-34 rear. I had 26 x 1.75 inch slick tyres, already used 3500 km. 1.9 inch not too coarsely treaded tyres are a better choice. My bike is equipped with S&S couplers and can be put inside a large backpack case. Mountain bikes can be rented at a few places. 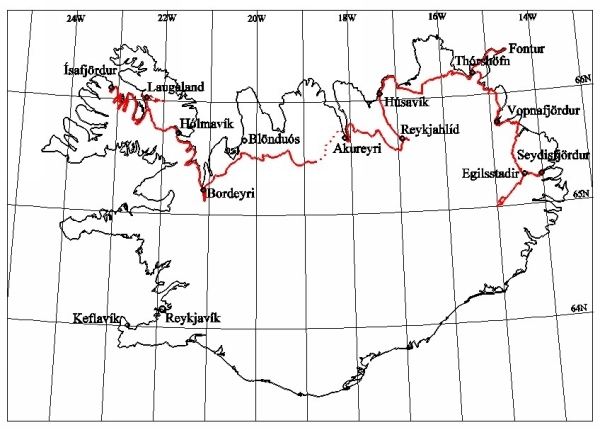 Egilsstadir and Reykjahlíd (Mývatn) had two and ten, respectively. Iceland is very good for motorcyclists too. Buses go on the road no 1, but the bus to Ísafjördur seemed to have been discontinued. I couldn't find where it starts, nor find any time table in Ísafjördur and the locals didn't know of any bus. The bus station for the country traffic in Reykjavík is near the domestic airport (opposite side of entrance to the airport). Cars can be rented to a high cost at many places. Air transport is rather inexpensive and frequent. Icelanders fly, especially in winter time. At Reykjavík domestic airport, an excursion to Angmagssalik in Greenland can be purchased (40 000 ISK, July 2002). Greenland has almost no roads for cycling, though. Organised bus tours to various tourist traps and recreation areas (Thingvellir, Geysir, Gullfoss, Thórsmörk, Reykholt, Highlands) start in Reykjavík. Be prepared for rain and strong winds and temperatures down to freezing point. Some years it is raining almost every day during the summer. Normal July temperature in Reykjavík is 12 degrees C (54 degrees F). 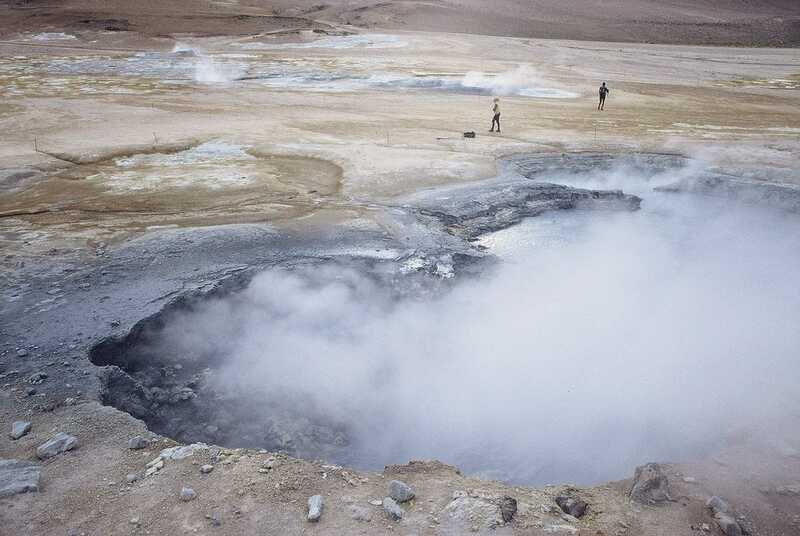 I have experienced 31 degrees C (88 degrees F) and sandstorm on north Iceland (July 1975), two four week holidays almost not using the rainwear (1980 and 1984), and stayed 30 hours in the tent in the highlands north of Vatnajökull due to heavy snowfall (July 1977). The arctic circle crosses Grímsey just north of the Iceland mainland. Elevation in the highland is 700 - 1000 m. Several mountain passes exceed 600 m. In June and July it is light 24 hours a day. The Icelandic language is a variant of the Nordic languages. Stress is almost always on the first syllable in the word. Letters with the ´ sign are independent letters, for example the é is pronounced je and ó ou. For the letters thorn and ed I have used th and d respectively in this text. 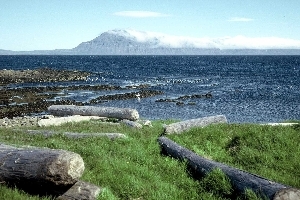 Examples: Thórshöfn, Súdavík. American maps use dh for the letter ed, for example Súdhavík. English is understood by most Icelanders under 50 years of age. Older people often know Danish, but hesitate to use it. Danish pronounced the Norwegian way is called Skandinavisk, and is quite understandable for Scandinavian people.